The Hero Light, my one-man performance of the stories of Cú Chulainn, is now touring. I first started working on the piece five years ago, and in 2010 I cycled the 350-mile route of The Táin, its central story, across Ireland. To mark the performance’s completion, I decided to serialize excerpts from the cycle trip here on the blog. ______________________________________________________________ In working with Irish myth, one can stand in virtually every spot where the stories’ events are said to have happened. The landscape of Ireland is saturated with these tales, and webbed with their plotlines; one can follow them across its contours. In 2010 I had been working with the Ulster Cycle for a year, fascinated by the lives of Cú Chulainn, Fergus, Conall Cernach, Briciu and Medb; and by the exuberant wildness, contemporary humour, beauty and tragic power of their stories. 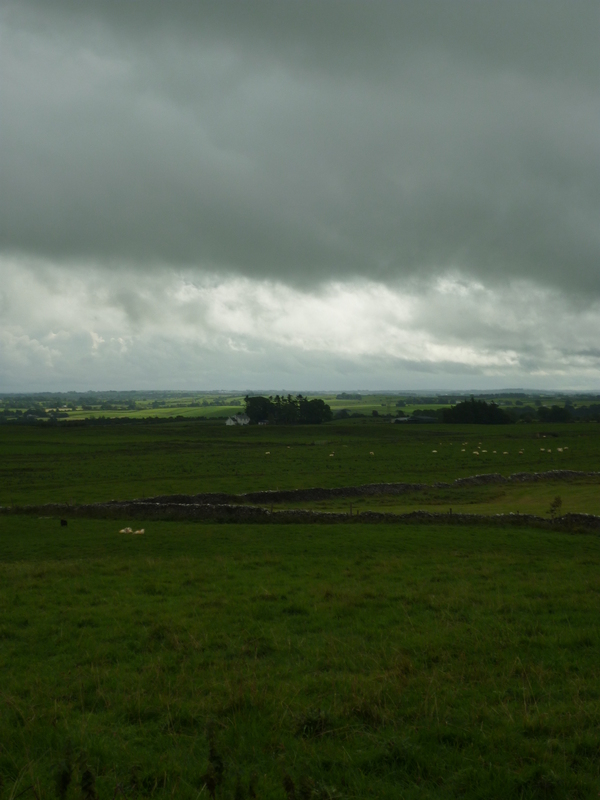 I’d been on a week-long trip to sites in Armagh, Down, and Louth in 2009. Now I planned to retrace the entire route taken by the army of Ireland in the Ulster Cycle’s epic centerpiece, the Taín bó Cuailnge, the Cattle Raid of Cooley. I realised that to feel what the route really meant was to experience it at the pace of the story – to cycle it, at the very fastest. So I bicycled from Rathcroghan in the west, across to the east coast, up to border with Northern Ireland and back, in a 350-mile figure of eight. I had been cycling virtually every day for a year beforehand. But that was mainly up and down the long, steep hill into town from the eastern outskirts of Lancaster where I lived. 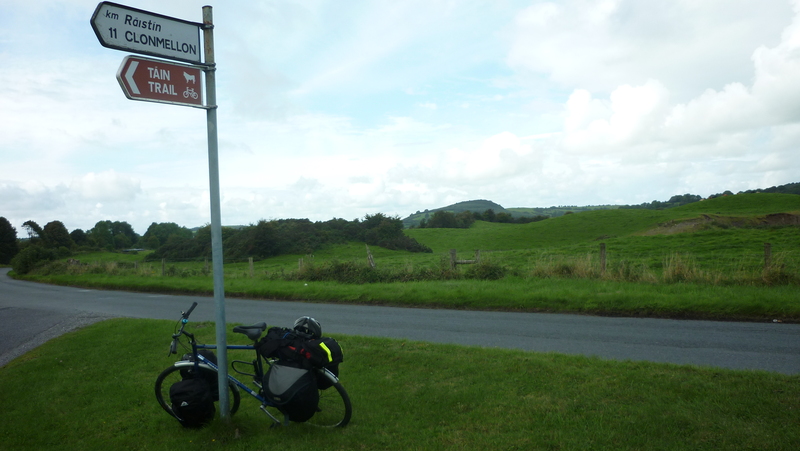 I’d never in my life been cycle-touring (though I’d done a lot of backpacking). And I’m useless at travelling light. When I trial-packed my kit it came to two back-panniers on the front of the bike, two more on the back and a rucksack strapped to the rack. I called a bicycle mechanic to give the bike a pre-trip service. “Err… is this the bicycle you’re going on a tour with?” He asked. I nodded. “It’s got a very long back axle. This is an old design, and a cheap one. It’s no good for cycle-touring really. If you go over a pothole carrying a lot of weight the axle will bend and that’ll be that”. “The axle will be bent. You won’t be able to push it. It’ll be an over-the-shoulder job”. A few days later I took the train to Liverpool, cycled to the docks, embarked for Dublin and was wave-rocked to sleep in my cabin (pried from the grasp of the ferry staff – hadn’t they read their own terms and conditions? ALL passengers with a vehicle got a cabin, and according to their own website a bicycle was a vehicle). 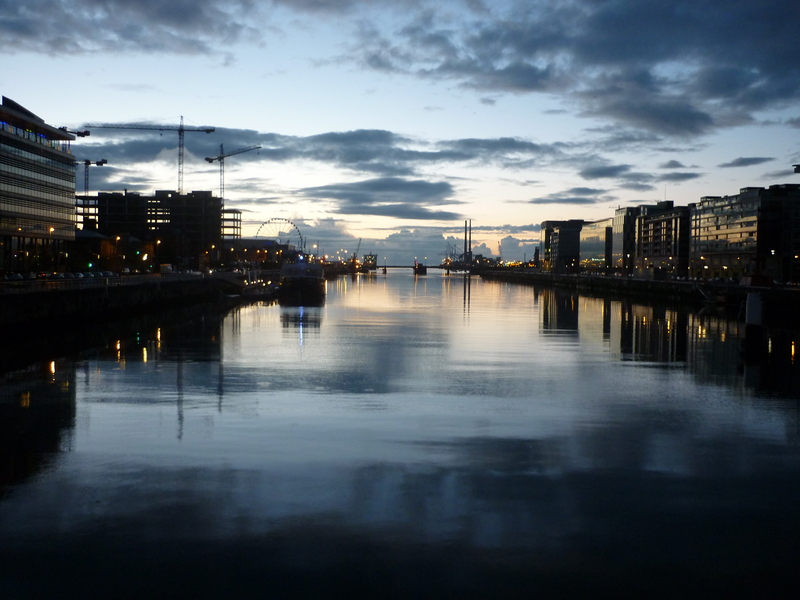 I pedaled off the ferry at 5am and through pre-dawn Dublin. At the railway station I boarded a train to Roscommon. When I rolled by bike off the train at my destination, it was raining so hard the drops were bouncing off the roads like hailstones. I come from the Lake District, an area boasting the wettest locations in England, so I’m no stranger to precipitation. But the weather during the trip was often unbelievable – and this was just the beginning. Anyway there I was heading northwest towards Rathcroghan, site of Crúachan Aí, fortress of Medb, legendary queen of Connaught. I could barely see for the rain, and I was terrified of potholes. After a few miles I looked behind me: the queue of traffic stretched back towards Roscommon. My bike was as wide as a two-wheeler can be with four panniers stuffed to capacity. At every sign of a pothole I would swerve erratically across the highway, and this had so unnerved the drivers behind that no-one dared overtake. I’m typing this first post of 2011 after a quick dash up to Baines Crag on the edge of Bowland moors, for a short climb in the fading light. The silver birch woods looked beautiful with that delicate interplay of pale bark against the purplish tracery of their twigs and buds. I’ve been researching Cumbrian legends today, including old versions of the Luck of Eden Hall, and discovered this fantastic source of out-of-copyright texts… an absolute treasure trove: http://www.archive.org/details/texts There are innumerable collections of folktales, myths and legends available through the site, amongst all the rest. Many are available to download as pdf documents, and as befits this traditionally cash-strapped post-Christmas period, they’re all free! Yesterday I was telling Cumbrian stories with my back to the fire in the bar of the Borrowdale Hotel, near the still-frozen shores of Derwentwater – a repeat visit with Tony Farren contributing music and songs, after our lovely session there on Boxing Day. Great audience and really convivial setting.